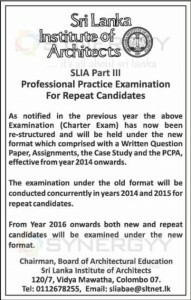 As notified in the previous year the SLIA Part III Professional Practice Examination (Charter Exam) has now been re-structured and will be held under the new format which comprised with a Written Question Paper, Assignments, the Case Study and the PCPA, effective from year 2014 onwards. The examination under the old format will be conducted concurrently in years 2014 and 2015 for repeat candidates. From Year 2016 onwards both new and repeat candidates will be examined under the new format. Chairman, Board of Architectural Education Sri Lanka Institute of Architects 120/7, Vidya Mawatha, Colombo 07.